Blue Diamond has been producing almonds since 1910. They've spent over 100 years getting to know almonds and they believe no one knows them, or loves them like they do. Honeybees pollinate Blue Diamond's Almond Trees and one third of the world's food supply. The health of honeybees is important so Blue Diamond is donating to Honeybee Research. Blue Diamond's Almond Trees love honeybees and they do too! 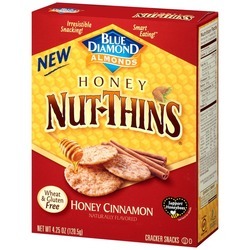 To celebrate this natural partnership, Blue Diamond has combined the flavors of almonds, honey and cinnamon to create a crispy cracker that's sure to be your new favorite gluten-free snack!